1. Whizz bread in a food processor to make coarse crumbs and mix with 25g of the Gruyère and 25g of the Parmesan, for the topping. 2. Heat oven to 190C and butter a large baking dish. A classic comfort food - easy, cheap, filling and delicious, what more can I say? For speed and ease, use a ready-made bechamel sauce. It's also great with sizzled cherry tomatoes on the side, instead of tomato slices on the top. 3. Cook macaroni in boiling water for 8 mins or according to pack directions, stirring occasionally to stop it sticking. Drain in a colander/sieve. Rinse out the saucepan then use it to heat the bechamel sauce until bubbling. Take off the heat, stir in the remaining cheeses and mustard and season to taste. Add the macaroni, stir then tip it into the baking dish. 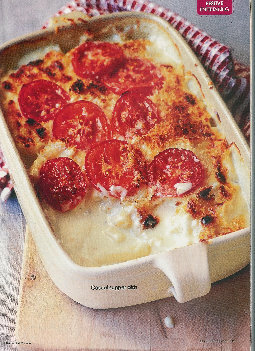 Scatter with cheesy breadcrumbs and tomato slices. Heat through in oven for 12-15 mins until browned and bubbling.